When visiting Zurich, Switzerland last week, I met Adrian Notz, the director of Cabaret Voltaire. Cabaret Voltaire was founded 1911 by Hugo Ball und Emmy Hennings, Hans Arp, Tristan Tzara and Marcel Janco and became quickly the home of DADA. Today, the place hosts one of the few really nice little cafÃ©s in Zurich, a shop and most importantly, an exhibition and event space. Cabaret Voltaire produces a program that explores notions of contemporary DADA and I was impressed by the degree of well-ordered chaos and spontaneity that characterized the current show Al Dadaida: The Revolution to Smash Global Capitalism. At the end of our meeting, Adrian gave me some gifts, items available at the shop, which I only took a closer look at when having returned to Berlin. 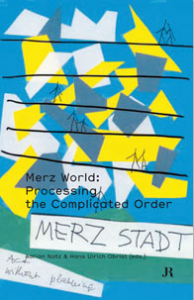 Among them was a little book that I started reading immediately, since I found the title extremely promising â€“Merz World: Processing the complicated order. In it is an interview of Yona Friedman whose work I appreciate a lot and Hans-Ulrich Obrist. I was fascinated by Friedman’s perspective on Kurt Schwitters’ Merzbauâ€“a work of art I was deeply impressed by already when I studied art history. Now that I am occupied with processes of art and design, this early fascination of mine makes total sense. If permitted, I would just copy the whole interview and make it available completely. But you know how it is, and so I decided to make available a couple of quotes that i found most inspiring with regard to the work and conceptual basis of prozessagenten. In some instances it really comes close to a potential prozessagenten manifesto. This complicated order is more far more general than we think. My dog is a very intelligent being. He lives in a world where he is not using mathematical formulas at all, but he completely understands the world and shows absolutely healthy reactions. What I want to say is that you cannot describe behavior by mathematical formulae, except as sequences. The difficulty with the city, with architectural products, is that they are based on behavior. Without the behavior of the user they are not complete. The only thing that completes them is that they are used. A building that has no users is not a building. It is a ruin. This shows that in architectural cities the planners are supposed to do something to satisfy the complicated order of behavior. But this is impossible because (â€¦) It is erratic. That means one step of somebody’s behavior does not give us the slightest information about what will be his next step. It can be anything. Intelligence starts with improvisation an this is true in every field. (â€¦) A good example is science: Newton and Einstein were improvisers. They had ideas born through improvisation. Only then was their work to find mathematical justification. So in this kind of work we improvise inside an erratic world and then, after that, we try to rationalize. And I think this is important as a principle because in classical architecture, in functionalist architecture, everywhere, it is first presented by the rational aspect. But it is in fact the rational aspect that should come afterwards. Also, I don’t talk about works of art, I talk about processes of art. We know that the public completes the work of art with its associations. I find it almost more reasonable that you make a work of art, and somebody adds something to it. From your point of view this might be an error of aesthetics. But it is not an error from the human point of view.